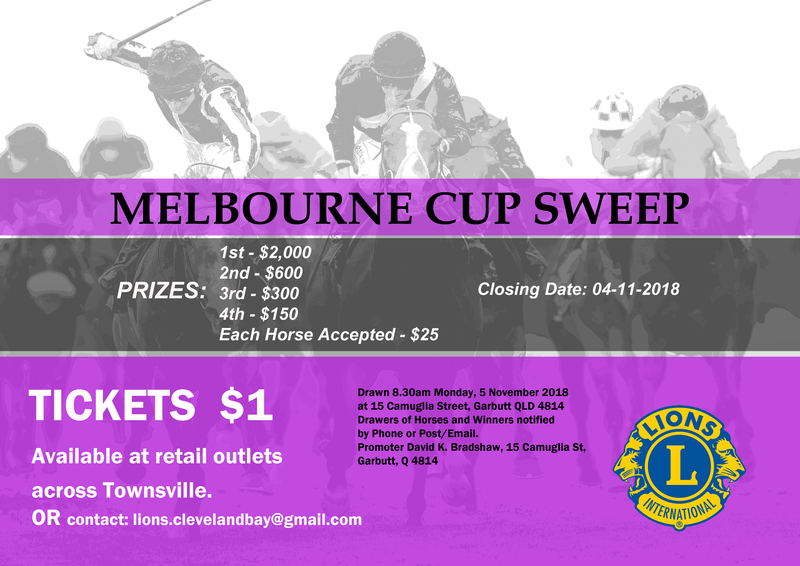 There are some projects that have a limited lifetime but the Melbourne Cup Sweepstake conducted by Townsville Cleveland Bay Lions Club is not one of them. The idea was mooted by our doyen Lion Keith Griffiths who had been involved in a similar one in Brisbane and we agreed to try it out. It was very successful so it was adopted by the Club as an annual project. That was 22 years ago! We are blessed with a few members who are retired or can spend day time on the “runs”. These involve getting permission from shops or traders who agree to place a collection box on their counter which is serviced every week to collect money and replace tickets from Mid September to the end of October. It is a pleasure to say that we have hardly had any refusals and when we arrive in our Lions yellow work shirts we are welcomed with open arms year after year. It is probably one of our trade secrets but some of our best performers are Pharmacies. Think of people waiting for their prescriptions! Lion Keith has steered the “Melbourne Cup” through all these years and it is true to say that the success of each year has reflected the prosperity of Townsville’s economy. Keith has undertaken the administration of the project which involves booking selling tables at shopping centres, providing them with our insurance credentials, keeping track of the tickets, sorting them and keeping account of the money, even doing his own run and sitting at shopping centres. Over all of these years the sweep has been one of the best contributors to our Activities account. 2016 did very well considering the depressed state of the economy here and the high unemployment. The draw takes place on the Monday before the race and Lion David Bradshaw kindly allows us to disrupt his business that morning and to phone the lucky drawers of horses. The prizes have changed very little over the years First is $2000, Second $600, Third $300 and Fourth $150. Each ticket which draws a horse earns the holder $25. Ticket prices have never changed. We find that the price of $1 results in better sales than would $2. The thinking is that @$2 people will buy one or two tickets but the $1 tag frequently ends up in a $5 sale. Our counterfoils have shown this to be the case and people who buy one ticket in one week will also buy another the next week. On the day of the draw everyone does their “run” to distribute the results and a thank you letter to all the outlets. 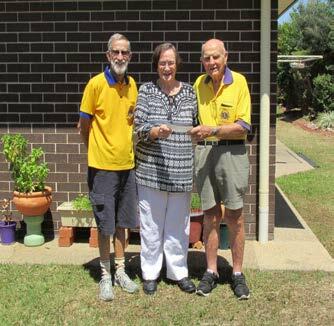 Prizes are posted out on the day after the race but this year we took the opportunity of presenting the cheque for first prize to Jean Murray at her retirement home and the picture shows [from left to right] Treasurer Victor Shields, Jean, and Lion Keith Griffiths making the presentation on the Wednesday morning.